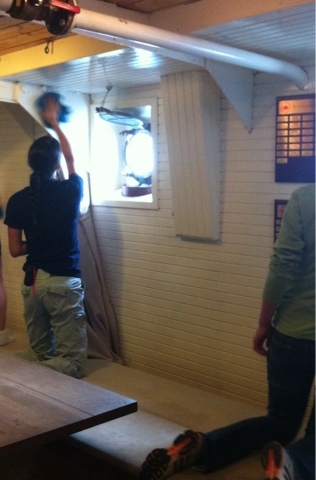 The ship gets cleaned every day. In port we usually do it all after breakfast and with everyone working it doesn't take long (about an hour). At sea cleaning is done as part of watch duties, usually in the morning. There are three general areas that need to be cleaned: the deck (swabbing anyone? ), the heads (ie. bathrooms), and banjer (the dorm style area). This morning I was part of the group cleaning the banjer. This involves wiping down all surfaces (walls, sea chests, tables, beams) as well as floor cleaning which is a 4 step process (sweep, wet mop, squeegee, dry mop). We had around 14 people working on that area so we were done in 45 minutes! Yay! Enjoying a bit of free time now before we get ready to leave. Tomorrow we'll be sailing/motoring through the Welland Canal.